The beginning of the year is the time for weight loss goals, new gym memberships, and the popularity of fad diets geared toward "shedding off the pounds." We set goals at the beginning of the year and aim for a healthier, better version of ourselves that is often long forgotten by the time December rolls around. As humans, we tend to care about the way we look to others and the way we feel at the end of the day. We understand that diet and exercise can go a long way toward helping us get fit, but sometimes those greasy cheeseburgers and sugary frappuccinos sound oh-so tempting. While we put a lot of consideration toward our own health and fitness, we don't always seem to put the same emphasis on our pets. My cat doesn't keep a food journal and his exercise generally consists of running up and down the hallway at 11 pm for no reason. In recent years, focus has been put on the pet obesity epidemic that has been silently creeping up on us as we measure our own waists in the mirror. Unfortunately, this focus is due to an increasing number of pets experiencing obesity-related conditions amounting to millions of dollars in veterinary expenses and a shortened life expectancy. In early 2018, insurance provider Nationwide released new data on pet obesity - uncovering that it's on the rise for the seventh consecutive year. How bad is it? 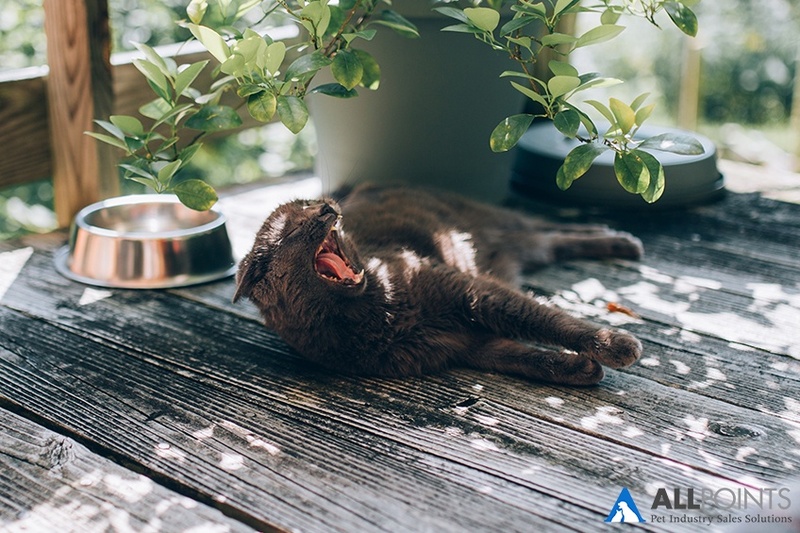 Well, according to Pets+ Magazine who shared the press release on their blog, 20% of their 1.4 million pet insurance claims in 2016 were for issues related to pet obesity. This ended up costing pet owners $62 million dollars in vet bills and claims related to obesity grew 24% in the last four years. In 2017, Banfield Pet Hospital found new research stating that about one-third of cats and dogs in the United States are struggling with obesity. In the last ten years, the number of overweight cats increased by 169% and dogs by 158%. As many of us would understand based on our own health, obesity is more than just a little extra body fat; it often results in uncomfortable, expensive, and sometimes life-threatening diseases and conditions. In cats, that means UTIs, chronic kidney disease, diabetes, asmtha, liver disease, and more. For dogs, this includes arthritis, UTIs, liver disease, low thyroi hormones, torn knee ligaments, and more (see the full list of most common obesity-related conditions for dogs and cats here). The pet industry has a responsibility to keep pets healthy and happy. Products and services that do not meet that goal should either be redesigned or tossed aside. With that said, before pet businesses can step in and help, it's important to understand first what is causing pet obesity. In a recent article, we explained that while the exact cause can't be narrowed down to one single culprit, some of the reasons for overweight pets includes extra (or unhealthy) food and treats, spaying and neutering too early, a lack of exercise or not enough exercise, and overall lack of pet owner understanding. Any number of these activities, or lack thereof, is a large contributor to the widening gut of many of our pets. Whether it be cats, dogs, small mammals, or any other pet, it's an issue that many Americans are slowly becoming more aware of. As they become aware of the problem, they will want to seek out a solution. Related Article: Why is Limited Ingredient Pet Food a Good Choice for Pets? Like with humans, one main part of the solution lies within pet food. It's the pet food manufacturers' duty to ensure labels are clear, nutrition guidelines are understood, and ingredients aren't innately harmful to animals. Challenges like inaccurate calorie calculation and unclear feeding guidelines are two factors harming, rather than helping, the issue of pet obesity. For the rest of us, the key is education. 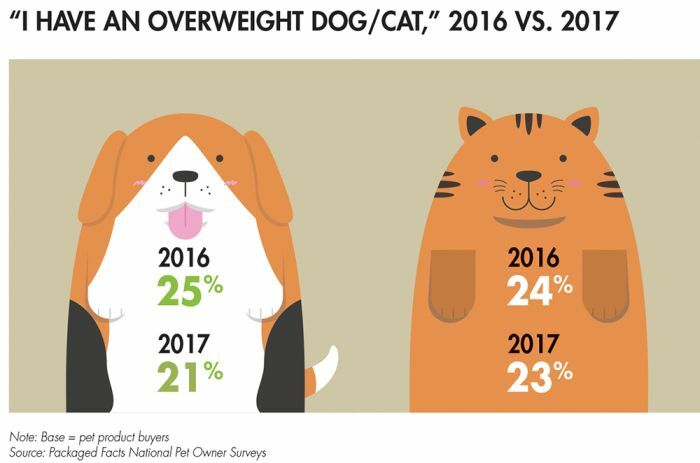 According to a Packaged Facts survey published on Petfoodindustry.com, only about a quarter of dog and cat owners realize that their pets are obese. As the humanization of pets continues to trend, it's up to the pet industry to help our fellow pet loving community understand what it means to have an overweight pet. In this year's marketing campaigns and outreach to consumers, consider adding value by educating them on the importance of understanding their pet's health. Once that is accomplished, focus on supporting pet products that encourage healthy diets and exercise for pets. Then, and only then, will pet businesses be able to work together to meet our unwritten goal of making pets happy and healthy.